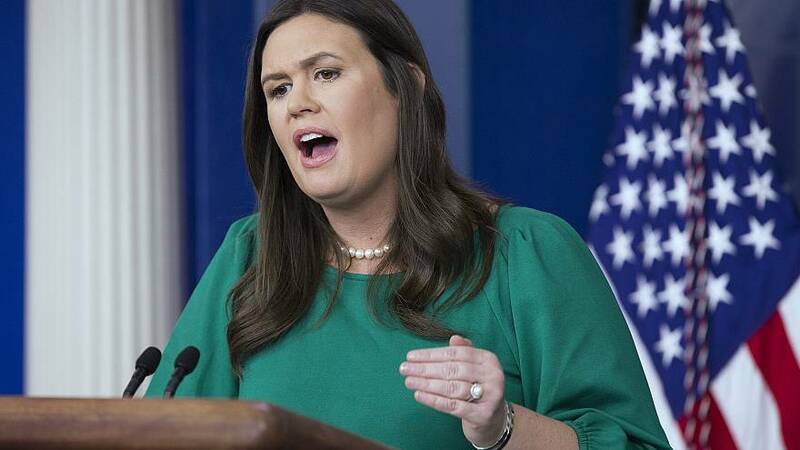 White House press secretary Sarah Sanders defended Attorney General William Barr in an interview Monday on NBC's "Today" show, saying the recently confirmed Department of Justice head did not make a "snap judgment" about whether President Donald Trump obstructed justice. "It's not a snap judgement," Sanders said, adding that Barr "takes his job seriously." The comments came after NBC's Savannah Guthrie pointed out that last year Barr authored a memo arguing that Trump could not have obstructed justice. Guthrie added that some critics said the attorney general — who determined that Trump did not obstruct justice within 48 hours of receiving special counsel Robert Mueller's report on Friday — may have acted with haste. "It wasn't that he took this upon himself," Sanders continued, referring to Mueller's decision to leave it up to Barr to decide whether the evidence presented in the report amounted to a criminal offense. "That's the process of the law. When the special counsel couldn't make a decision, couldn't make a final determination, they refer that to the attorney general to make that decision." She asked viewers to "look at Bob Mueller's report," which has yet to be released. "Big takeaway here is that they could not find something conclusively that the president obstructed justice," she said, adding that Barr consulted with Deputy Attorney General Rod Rosenstein "who had no memo" on obstruction of justice and "had been intimately involved since the beginning" of Mueller's investigation. In a letter to leaders of the House and Senate Judiciary Committees on Sunday, Barr wrote that Mueller's investigation did not find collusion between the Trump campaign or anyone associated with it and the Russian government in its efforts to influence the 2016 presidential election. Barr added that the special counsel declined "to make a traditional prosecutorial judgment" on obstruction of justice, leaving it up to the attorney general to draw a conclusion about actions such as the president's firing of then-FBI Director James Comey in May 2017. Barr said he concluded Trump did not obstruct justice based on the evidence presented and not because of Department of Justice guidelines on prosecuting a sitting president. "The Special Counsel states that 'while this report does not conclude that the President committed a crime, it also does not exonerate him,'" Barr wrote. Trump called the Justice Department's findings a "complete and total exoneration." Mueller was tasked with investigating Russian interference and possible collusion by Trump associates, submitting his final report to Barr on Friday. Mueller's investigation led to the indictment or conviction of 34 people, including major Trump associates like former campaign chairman Paul Manafort and former national security adviser Michael Flynn. None of those charges, however, included a direct allegation of colluding with Russians to swing the 2016 election.